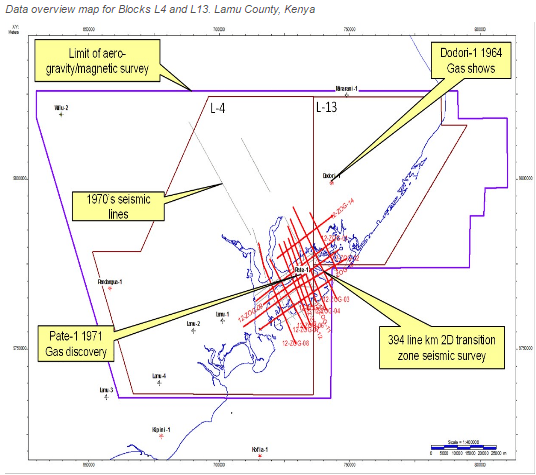 Chinese geophysical services company BGP has taken Zarara Oil and Gas the operator in blocks L4 and L13 to court over the non-payment of Kshs. 90 million after the contractor offered seismic services in Lamu county. The exercise that involved 374km of seismic lines acquired by Zarara in 2012 according to BGP was completed successfully only for the operator to fail to honor the entire debt with $873,561 left in arrears. BGP which has lodged a suit at the high court in Nairobi through its general manager Zhao Enhui says Zarara has over the last over four years not settled the debt and instead offered the company empty promises on when to clear the remaining sum despite having acknowledged the debt. “The defendant has for a period of over four years neglected and or declined to fully settle its debt herein but has instead elected to shift goal posts and give the plaintiff empty promises on payment of the same despite having fully acknowledged the debt and confirmed the outstanding amount,” Enhui is quoted by the business daily. Zarara has on its part has on its part blamed BGP for doing sub-standard work during the exercise which led to jeopardy of its interests in blocks L4 and L13 and maintains that resulted to the disputed payments. The map below shows the block boundaries for Blocks L4 and L13, marked in dark red and the location of the gas discoveries of Dodori-1 in Block L13 and Pate-1 in Block L4. Also shown, in red, are the 374km of seismic lines acquired by Zarara in 2012 and in grey some earlier data acquired in the 1970’s. BGP wants Zarara restrained from disposing its interest on the two blocks as it does not have any other physical assets in Kenya and it would prove ways to recover its debt should Zarara exit from the two licenses. Zarara on its part has termed the allegations as unsubstantiated that it was considering selling these two acreages and wants the case referred to arbitration as their contract calls to disputes by the two parties be settled by arbitration in accordance with the Rules of the London Court of International Arbitration. Zarara is currently planning to drill the Pate 2 well in Pate island to appraise the former Pate 1 discovery. MRI, through its wholly owned subsidiary Zarara Oil and Gas Limited (‘Zarara’), holds a 75% working interest and is the Operator of Blocks L4 and L13, predominantly located onshore Kenya. The residual working interests, both free-carried until final approval of planned commercial production, are held by CH-Swiss Oil Holdings International at 15% and the National Oil Company of Kenya at 10%. MRI has negotiated a legally binding heads of agreement for the eventual acquisition of the 15% interest of CH-Swiss Oil Holdings.